WASHINGTON COUNTY – Washington County’s incomparable landscape, which includes places such as Zion National Park, Snow Canyon State Park, Red Cliffs Desert Reserve and many others, has been inspiring writers for over a century. A new workshop in the area applied the power of the region’s majesty and complexity to challenge students to see things in a new way and then translate their observations into writing creatively. Over 80 students from eight schools throughout the county converged at Springdale’s Canyon Community Center Thursday for the first Washington County Youth Creative Writing Workshop. 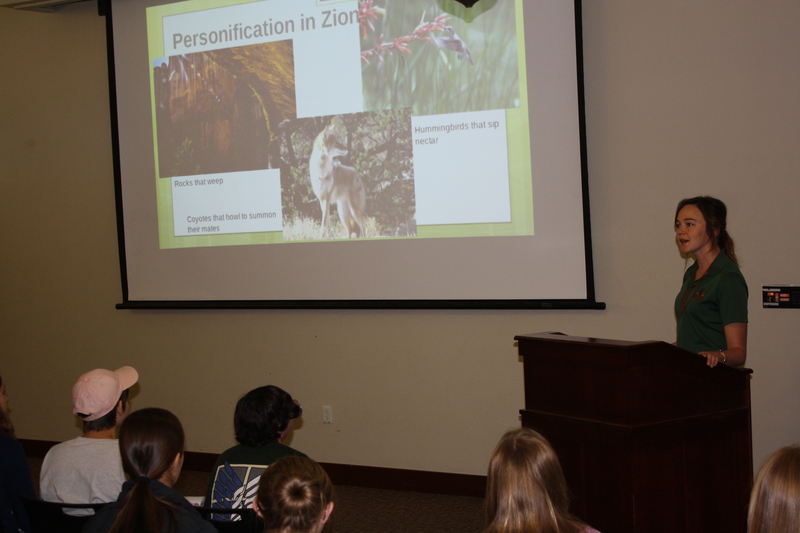 The workshop began with a presentation on finding metaphors and similes in nature. In the metaphor activity, students compared themselves to something they see in nature, everything from trees to pebbles. In the simile activity, they compared two seemingly dissimilar items, such as a stream to a willow or a mountain to gold. As the students thought about personification, they gave two of Zion’s famous monoliths personalities and emotion; they were tasked with telling how The Watchman and Lady Mountain get through their day. Next they learned about sensory language, particularly synesthesia, describing an object in nature with senses that might not make complete sense – what sandstone tastes like or what a juniper sounds like. 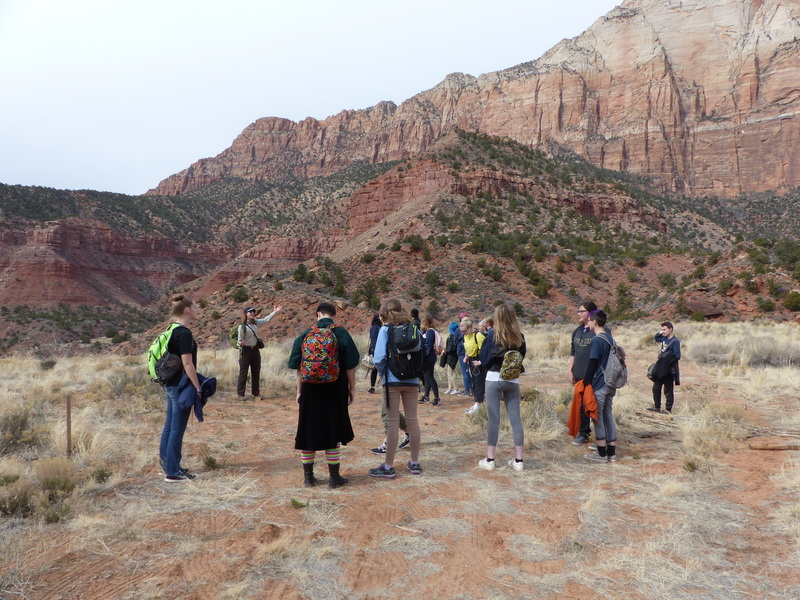 Volunteers from local land management and advocacy organizations, including the Bureau of Land Management, Red Cliffs Desert Reserve, Zion National Park Forever Project and Conserve Southwest Utah participated in the workshop. As they led students on nature hikes students found inspiration and ideas for a masterpiece poem or personal essay they would write about what they saw, heard, smelled, touched and tasted. 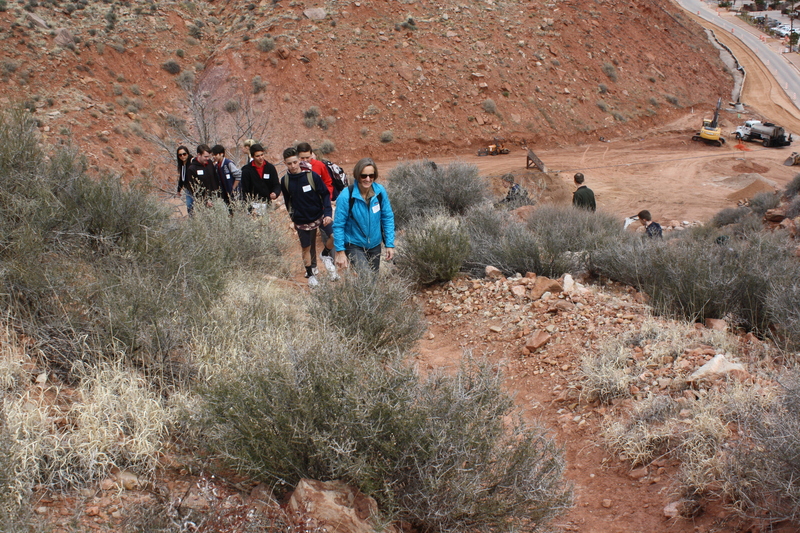 Susan Crook, land program manager for Conserve Southwest Utah and one of the event’s organizers, recalled one of her favorite assignments as a college student: “Sit quietly, almost invisibly, and be in the moment sensing and writing about what I observed with all five senses.” And that is exactly what students attending the workshop did. “Slowing down and really observing what is around them gives the students a chance to feel what they are seeing and to paint those feelings in word pictures,” Crook said. Nature writers rooted in knowledge of their local flora, fauna, lands and community issues are able to use their words in powerful, tender and galvanizing ways. Their voices call for celebration and protection of the landscapes that nourish and enable families, communities and industries to thrive. For me, the Washington County Youth Creative Writing Workshop is about empowering young writers to use their voices for the protection and stewardship of our precious lands in southwest Utah. The workshop was also the kickoff for the Washington County Youth Creative Writing Contest, whose theme is the beauty of Washington County’s natural landscape. The contest seeks poetry (30 lines or less) and personal essay (300 words or less) submissions from students in grades one to 12 who are inspired by their awe-inspiring surroundings. Winners will receive cash and merchandise prizes and will be published in a chapbook. To submit an entry to the contest, students are invited to visit highability.washk12.org, to like the contest’s Facebook page or find it on Instagram, all of which include a link to the submission form. Editor’s note: The author of this article is one of the organizers of the creative writing workshop.